With two types of Fuchsias offered for sale, the hardy varieties can be grown outdoors and left over winter. Many of these have been proved over several years before being offered for sale. The other group are not hardy and will either need to be grown in containers and overwintered on a patio or in a greenhouse, or perhaps grown in hanging baskets. Fuchsia plants are a colorful flowering plant (picture right) that do well in the garden border and are available for sale from Nurseries and Growers from mail order nurseries in the UK. Coming in many forms including Trailing , Pot & Bush Fuchsias as well as hardy and Triphylla Hybrid types. These are a versatile plant that can be grown in hanging baskets or as standards. Native to Mexico, West Indies and New Zealand they have been hybridised to produce new forms such as the popular Fuchsia 'Bella Rosella' a trailing fuchsia used widely in hanging baskets. The Triphylla types such as 'Brighton Belle', pictured right reall are a must for any Fuchsia enthusiast. 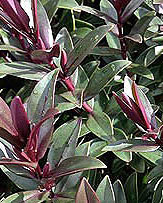 Characterised by deep green foliage and pink to red and orange flowers that hang in clusters. These are excellent varieties both for hanging baskets as well as for growing in containers. You can aslo use them as summer bedding plants, they are vigorous growers and fairly upright. These types flower from the new growth on the very tips of the stem, from pruning they will take 3 months to flower. However they will flower right through until the cold sets in again. 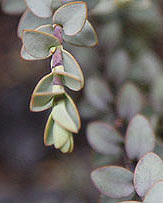 Some of the best Triphylla types availble for sale include : Adinda, Bornemann's Beste, Chanty Park, Fred Swales, Lee Anthony, Stella Ann and Traudchen Bonstedt. In general the hardy type are not that particular about soil types as long as drainage is good. However we recommend the following soil preparation before planting. Dig in a good amount of well rotted compost and aged manure a few weeks before planting. In poorly drained areas, rather they trying to improve drainage by placing crock and other material in the bottom of the planting hole, try hilling up the soil instead. Fuchsias have fairly shallow root systems so ne ed to be planted where they will not be disturbed. We suggest staking plants for the first year to allow the root system to be developed. Water in well with a liquid seaweed fertiliser and maintain moisture through any dry periods in summer. 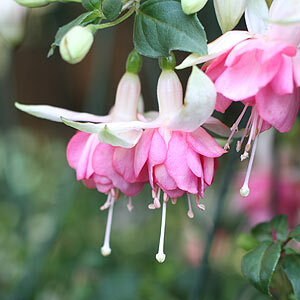 If you need to prune fuchsias, in the UK it is best to prune them in early spring. 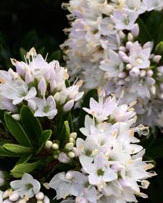 They are easy to prune, simply look for a pair of buds that are beginning to swell and prune back to them. You can also hard prune to leaf buds around 6 inches above the ground. All outdoor fuchsias should be pruned after the danger of frosts has passed. This reduces the chance of the new buds being damaged by frosts. Fuchsias prefer a cool sheltered position, morning sun is ideal. A humus rich moist soil, prune back after flowering to maintain shape. 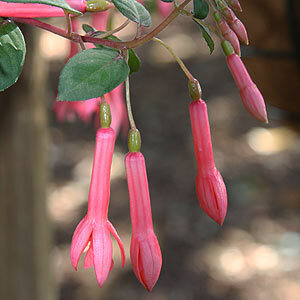 Fuchsia 'Celia Smedley' has red to purple flowers with white pistils. Fuchsia heidi ann attractive double red and pink flowers. 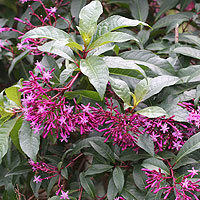 Fuchsia arborescens or Lilac Fuchsia (pictured right) is also referred to as the 'Tree Fuchsia'. Not your normal fuschsia appearance from this species, however it does flower over a long period. 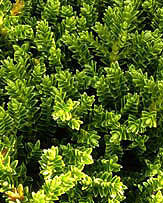 Evergreen and with masses of flowers emerging from pretty pink buds are held above above attractive dark green foliage. Will reach 2m + and is seen as frost hardy. well worth a place in the garden.